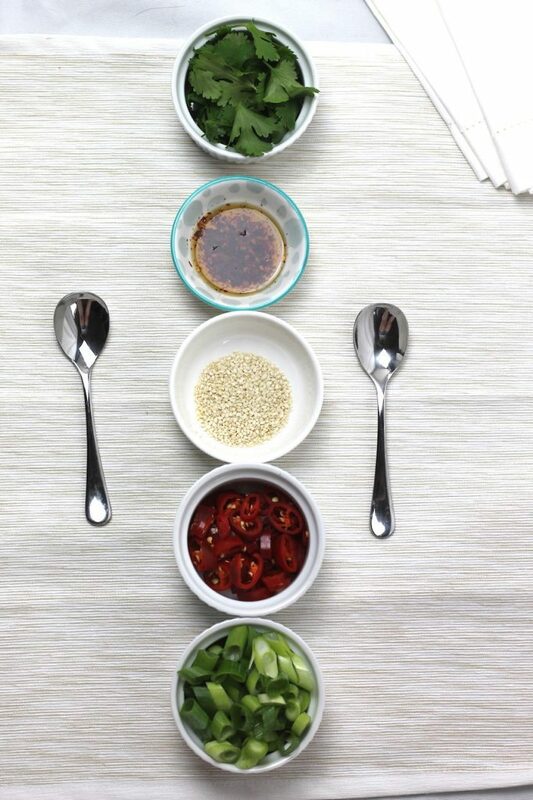 I love a dish with lots of little extras to customise your meal. 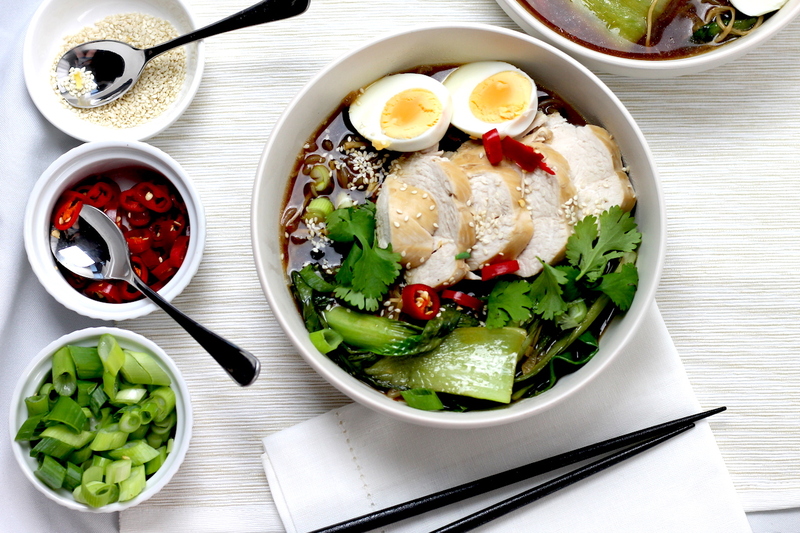 The base of Ramen are simple noodles in a broth, but you can get any variation these days. I’ve even seen dessert ramen. Crazy, I know. Sounds revolting to me… but then I’ve been guilty of eating the occasional dessert pizza, so who am I to judge. Pad Thai is one of my favourites dishes of all time, where you can shake on your chilli, drizzle it with oil, add extra crispy fried onions… mmm. I’ve made a Keto Pad Thai and it’s a total winner. Asian cuisines lend themselves particularly well to this style of eating. I also used these add ons in my Keto Chow Mein bowls. You’ll see I’ve got all the add ons here, but it’s totally up to you which ones you include. Strictly speaking, this is a cheats keto ramen. If you are making a very traditional Japanese ramen, you would make your own broth and simmer it for a long time, really getting maximum flavour out of it. 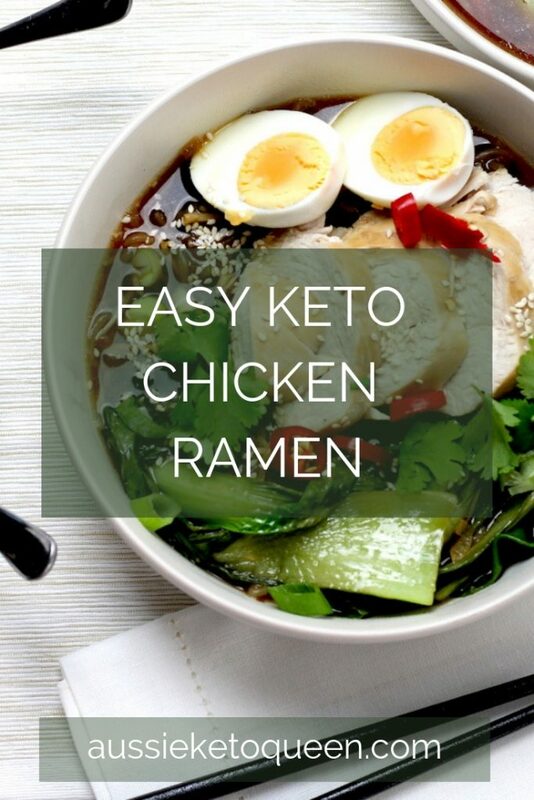 I’ll do it one day… but for today, this Easy Keto Chicken Ramen needed to be in my belly ASAP, which meant a shortcut was needed! I used a store bought chicken stock to shortcut the labour time. You can make your own of course. 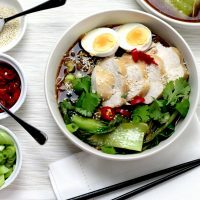 Using chicken bone broth would take the flavour of your Keto Chicken Ramen to the NEXT LEVEL. It has to be good quality though, because your chicken will be poached in this liquid so you don’t want any nasties tainting your delicious Keto Chicken Ramen. 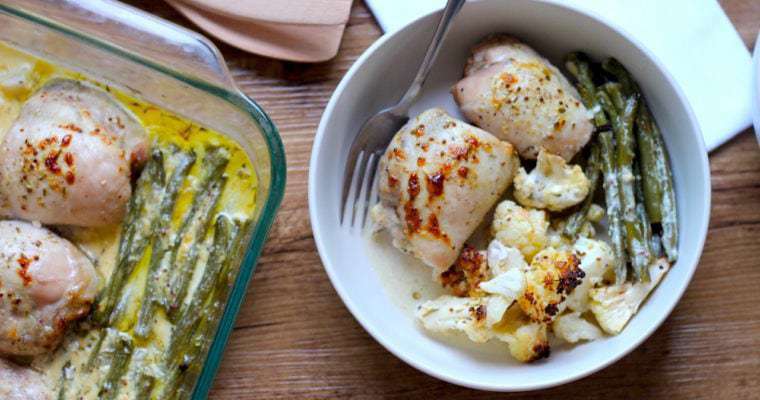 This is a really versatile dish and a great way to use up whatever veggies you’ve got around or are on special. It requires mushrooms, and in this case, I found an ‘exotic mixed mushrooms’ package that was on its due date for $2, so that’s what I used. Obviously being a Japanese dish, it does go really well with asian mushrooms like Oyster mushrooms, shiitaki and enoki, but if you want to use button mushrooms or leave them out, that’s totally fine as well. Enoki mushrooms creep a lot of people out (ie. my husband), so more creepy mushrooms for me! Don’t be scared, it’s easier than you think. You might say chicken breast is bland, dry or boring. If that’s you, I challenge you to a juicy chicken duel. That is juicy chicken right there. I promise. Sure, the little pointy end got a bit dry, but 80% of it was juicy, succulent and mouth wateringly delicious. You could also use cooked chicken if you had left over roast! Just add it in right at the end until it’s heated through, being careful not to overcook it. You could even use chicken thighs for this Keto Chicken Ramen, but you can’t slice them all pretty like in this picture. If you’ve got a big saucepan or stock pot, make a double or triple batch and freeze the delicious broth! It’s great to whip out at any time and chuck in whatever veggies and meat you’ve got, and dinner can be on the table in 20 minutes. Lastly, a note about konjac noodles in this Ramen. Some people love them, some hate them. If you are on the fence, I encourage you to follow the instructions on preparing the carefully, as it can make or break the texture. For this recipe, I used Changs Lo Carb Noodles (in the supermarket aisle with the other noodles). If you eat too many, they can sit really heavy in your stomach. In this recipe, 400 gram packets are used but the drained weight is around 200 grams – so you are eating 100 grams of noodles each. For kids, I’d suggest cutting this down by half again. I hope you enjoy this tasty Keto Ramen! 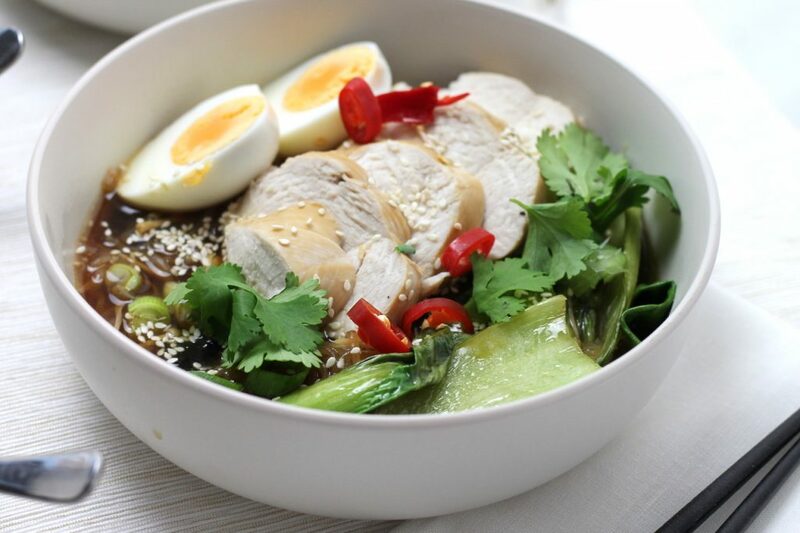 This delicious Keto Chicken Ramen dish is simple to prepare and is full of flavour. Fun for the kids loaded with noodles and broth. In a large sauce over medium high heat, add sesame oil, onion, garlic and ginger. Saute for 2 - 3 minutes until fragrant. Drain and rinse the konjac noodles thoroughly. Add the konjac noodles and cook for 4 - 5 minutes until the noodles get ‘squeaky’ - you’ll know it when it happens! This helps dry them out so they take on the flavour of the dish. Add the remaining broth ingredients and taste for salt and chilli - this will depend on your chicken stock used and you may not need salt at all. Bring to the boil then turn down to a medium-low simmer. Add the chicken breasts and poach until just cooked. Depending on the size, this is usually 12 - 15 minutes, but I recommend using a thermometer and removing them when the middle just reaches 73C. 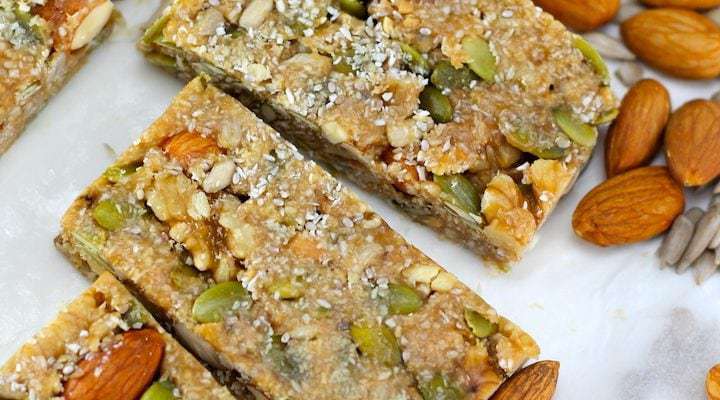 Set aside to cool slightly, then slice in 1cm slices. Add the baby bok choy to the broth for 30 seconds until just wilted. 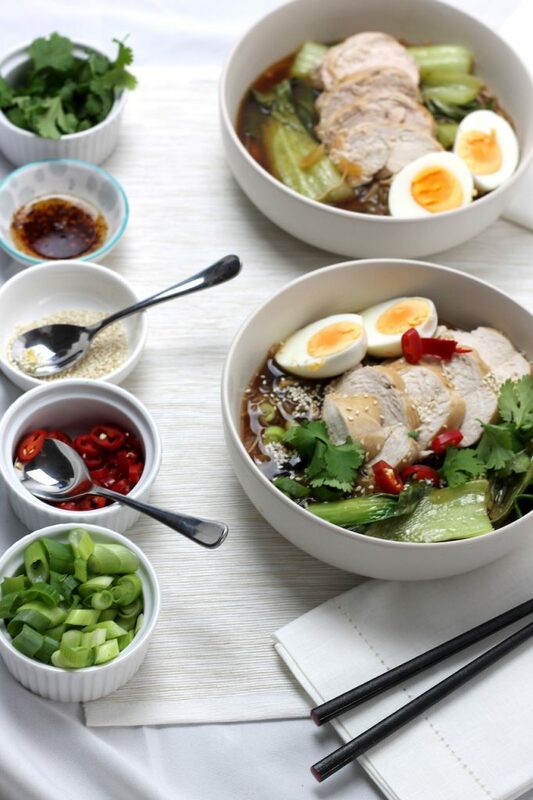 Serve in deep bowls with noodles, broth and mushrooms, then top with chicken and boiled egg. Diners can choose which add ons they want to put on top!